This chapter classifies strategic foresight methods and organizational functions using the Eight Skills and Twenty Specialties of the Adaptive Foresight model. In addition to the top twenty specialties, we list a few more common organizational functions that can help in applying each skill. We offer a starter set of practitioner methods related to each skill, and one-sentence descriptions for each. Many more can and should be added, and these methods also should be ranked and qualified by application by experienced practitioners. Methods are presented in alphabetical order, with links to Wikipedia or other online information sources. We won’t teach any of these functions or methods in this version of the guide. For that you might skim one of the methods texts at the end of this chapter, do a just-in-time online consult with an expert, or join one of the Specialty Foresight Associations listed with each skill. At the end of the chapter we will highlight just one function, Investing, as, in a world of accelerating technological change, it is today so helpful to securing personal financial security as well as for generally improving your anticipation skills. The European Foresight Monitoring Network did a nice survey of foresight methods used around the world in their Global Foresight Outlook (PDF) (2007). Foresight scholar Rafael Popper of the U. Manchester Business School has a concise overview of thirty-three foresight methods, divided into Qualitative, Semi-Quantitative, and Quantitative categories. 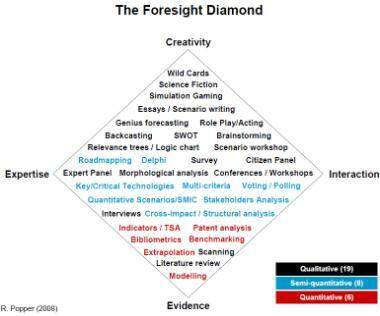 He also developed the Foresight Diamond, a way to display these three categories of foresight methods along two axes, Creativity vs. Evidence-based and Expertise vs. Interaction-based (picture at left). No categorization scheme is complete, and all are somewhat arbitrary, but good schemes have evidence and theory behind them, are reasonably comprehensive, clear, topically balanced, and suggest strategies for future development of the field. In these ways, we hope you find these recommended skills, functions, and methods helpful to your foresight practice and professional development. Next are one-sentence descriptions and commentary on roughly 150 foresight methods, both simpler and more complex, arranged by skill. This is by no means a comprehensive list but it is a good starter sample. It also presents a number of methods that have been overlooked in previous reviews of our profession. We hope it will spur your thinking about how to be a more effective foresight leader in your organization.